Two "price tag" acts were recorded in Jerusalem and near Ramallah overnight. 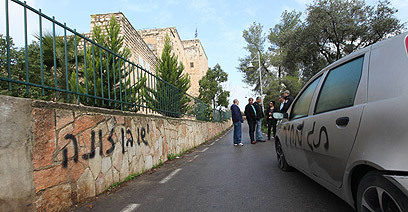 Hebrew hate slogans, including "Jesus is a son of a b****h" were spray-painted on a monastery in the capital's Valley of the Cross. The tires of three vehicles parked nearby were punctured and one car was found with a graffiti reading "Happy Hanukkah, triumph for the Maccabees." Jerusalem police have launched an investigation. 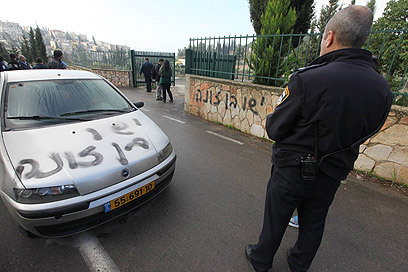 In a separate incident in a village near Ramallah, a car was torched and "price tag" graffiti was found nearby. Security forces are probing the matter. Wednesday's event is the second "price tag" attack on the Jerusalem monastery. "It saddens me deeply," said Father Claudio. "I believe in Jesus and some don't, it's their problem. We believe in peace and I forgive whoever did this the first time and this time. I want to wish everybody a Happy Hanukkah." Police commander Haim Blumfield said, "This is the second time we've seen such vandalism here and I believe we will find whoever is responsible. The case of the previous incident remains open and I hope today's event will help us find the culprits." Last week, Shai District Police arrested three men in their 20s while they were trying to vandalize Palestinian property in the West Bank village of Samu'a. The suspects torched a car in the nearby town of ad-Dhahiriya and spray-painted graffiti before being apprehended. They were found in possession of flammable materials, pocket knifes, spray paint and a fake M-16 rifle that they evidently used for deterrence purposes. The Supreme Court later rendered a precedent-setting ruling saying the suspects could not meet with their attorneys. A legal source told Ynet that the ruling effectively likened such "price tag" acts to acts of terror. According to the source, the ruling represents the State Prosecutor's Office's new policy: "This move aims to illustrate the severity in which the legal system views 'price tag' acts." He added that it was part of the "new gears" in the fight against ideologically-motivated crime. 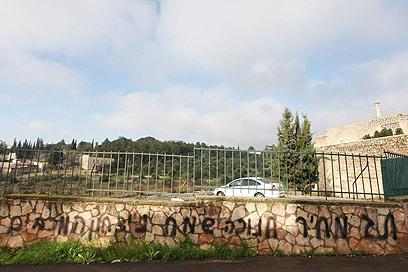 See all talkbacks "'Price tag' vandals target Jerusalem monastery again"